What Does SEO Mean for Local Businesses and Why Is It Important in 2019? What does SEO mean for local businesses, anyway? SEO is a diverse topic, a cornerstone of a multi-billion-dollar industry. Before we dive any deeper, have you heard of the service Google My Business? It was previously known as Google Local and Google+ Local. Now it’s often just referred to as GMB. If you haven’t heard of it before, it’s your business profile on Google. It feeds your information to places like Google Maps, Yelp, and the local pack on search engine results pages (SERPS). It’s one of the key features that’ll distinguish you from your competition in today’s noisy digital world. It’s also one of the critical elements in setting up your SEO for local business. To understand why that’s important and what impact local SEO has on businesses in 2019, read on. What Does SEO Mean to Businesses? Just to make sure we’re on the same page, let’s clarify the term search engine optimization (SEO). 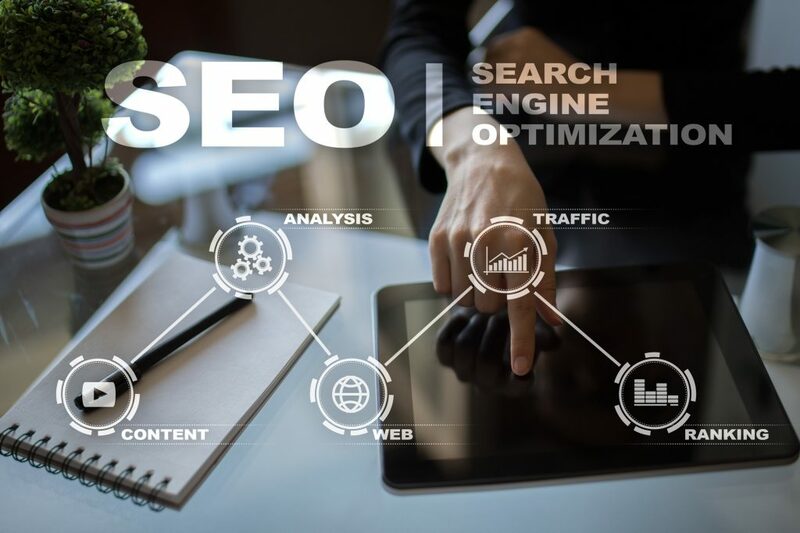 SEO is the practice of increasing the quality and quantity of traffic to your website through organic search engine results. The quality of your traffic is a measure of how likely they are interested in what your site has to offer. Let’s assume your site only sells organic tea, but your visitors are looking for John Deere tractors. Then you’re receiving low-quality traffic. It’s unlikely you’ll get many tea sales from this crowd. Your quantity of traffic is simply the number of visitors who arrive at your site. More traffic is preferable, as it means a higher chance of your website serving its purpose. Regardless of if its purpose is to simply give information or sell a product. Also, organic traffic is simply traffic you don’t have to pay for. Paid traffic, on the other hand, includes things like sponsored affiliate links or social media ads. The goal for businesses is to have a high SEO ranking, high quality of traffic, and medium- to high-quantity of traffic. When you match that with a stellar website and excellent service or product, you’re guaranteed success. With billions of websites competing for traffic, both viewers and search engines need a way to differentiate between them. SEO helps with this, ensuring viewers land on pages that match their search criteria. But with so many websites now in operation, further distinctions are useful. For instance, let’s assume you’re shopping for a new leather couch. Furniture stores in London wouldn’t be as useful as stores in your own neighborhood. This location-based segmentation is one of the newest ways that Google and other search engines determine a site’s page ranking. These search engines are now quite good at evaluating the quality of your website. They’re also good at determining the relevancy of your site. Does it match the search query? To have your site rank for location, you must perform some extra steps in your SEO. Don’t worry. We’ll give you a brief overview in the following sections. The important take away is that local SEO is decreasing the quantity of overall traffic reaching most sites. But, more importantly, it’s increasing the quality of that same traffic. As any expert marketer will tell you, that’ll result in an increase in conversions. Local SEO is as important to businesses in 2019 as voice search technology will be to them by 2022. The state of technology is ever changing. Businesses like yours must stay current. If you don’t, your competition will advantage of newer technology and steal your business. When a user types a query into a search engine, keywords tell the engine to focus on local results. Words like nearby or near me will tell the engine to search by location. Also, using the name of a specific city, county, or state will limit the search options. Ok, so you can set up your SEO to target people searching in your location. But what happens if your brick and mortar store is located in more than one city? What if you have multiple branches or service many cities? If you own a business with more than one location, you set up multiple local SEO strategies. For more information on multi-location local SEO services, you can view here. For the rest of you, jump to the next section. Localize your website. Include your country, city, or region name naturally throughout your site. Also do your best to get your name on other local sites, such as stores, newspapers, and schools. Get your business on citation sites and online business directories. Yes, it’ll help customers find you. But more importantly, your company’s website URL, phone number, address, and name will be there. Search engines cross-reference this information and compare it to what they have on hand. The more often they find external sources that reinforce this info, the higher they rank the accuracy. The higher the accuracy, the higher your page ranks. Claim your business on Google My Business. Look, Google is the uncontested leader in search engines. If your business info isn’t stored on their servers, your business isn’t going to pop up on maps or local search results. It’s critical. Respond to reviews. The reviews themselves show search engines that your site is trustworthy. More reviews and higher scores translate to more trustworthiness. You can help moderate these through your responses. Get quality backlinks. When trusted sites link to your site, search engines trust your site more. Seek out backlinks from your local papers, schools, chamber of commerce, and the like. Google and other search engines will rank you higher both overall and locally. If you’re still wondering what does SEO mean, then we’re in trouble. By now, you should know why SEO is important for your local business, and how to leverage it to increase business. To add SEO to your current online presence is a mechanical process. If you’d like to learn more about it or other SEO processes, you can find that information in our free Search Engine Optimization Articles.